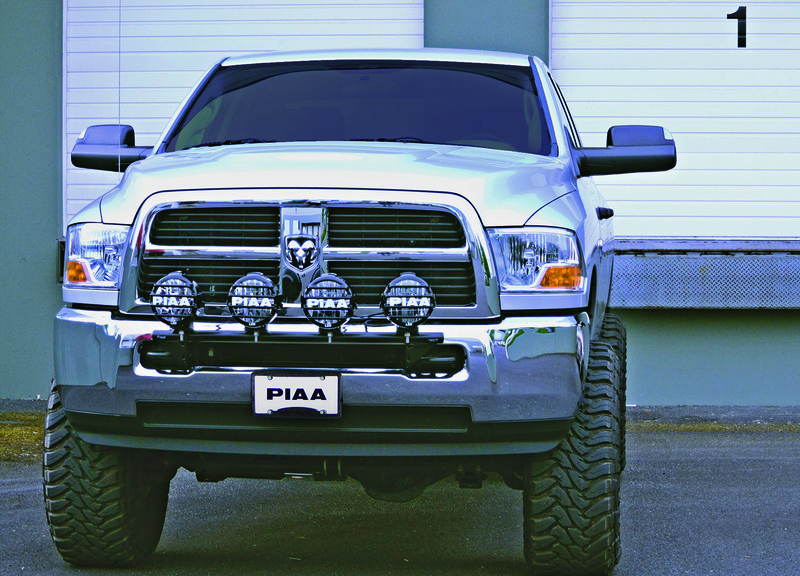 Portland, OR, September 23, 2013 – PIAA announces the introduction of a comprehensive line of vehicle-specific light bars for mounting auxiliary lighting on popular domestic and imported pickup trucks and SUVs. Some twenty part numbers will cover popular trucks from Ford, Chevrolet, GMC, Dodge, Jeep, Nissan, and Toyota, with coverage for some models as old as 2004. These new light bars from PIAA (pronounced pe’-uh) are carefully engineered to be direct bolt-ons for the designated vehicles, and are supplied with all necessary brackets, hardware, and detailed, well-illustrated instructions. All bars will accommodate up to four separate lamps as large as 9”, except the Jeep Wrangler bar, which accepts two 9” lamps. Of particular interest is PIAA’s exclusive three-step powder coating process, which offers an unusually high level of durability and resistance to chipping and scratching, even in rugged off-roading conditions. PIAA starts with a thorough media blasting of the entire light bar in order to provide a clean and textured surface for maximum adhesion of the coatings that follow. Next is a zinc primer powder coating, followed by a high quality, semi-gloss, black powder coating. This combination of careful preparation and advanced powder coating technology provides an attractive and durable finish that will offer maximum protection against damage and corrosion for years to come. Every PIAA customer enjoys the benefits of The PIAA Advantage, which features advanced technology from the best minds worldwide, lamps and bulbs for virtually every type of vehicle, and race-proven quality and durability supported by a Limited Lifetime Warranty on many products. Motorists, off-roaders, and racers have access to technical and product support unmatched in the industry. Most important, everyone using PIAA products is assured of the finest illumination safety available at any price. Thanks to The PIAA Advantage, the road to better visibility begins with PIAA. PIAA Corporation is a global leader in the design and manufacture of replacement and specialty lighting products for the on- and off-highway automotive, powersports, all-terrain, and motorsports industries. Founded in 1963, The PIAA Corporation offers nearly a half-century of expertise in developing and manufacturing world-class products that customers can use with pride and confidence. Offerings include Halogen, H.I.D. (High Intensity Discharge), and LED (Light Emitting Diode) lamp assemblies and bulbs, as well as a variety of related bulbs, installation kits, and accessories. Visit the company’s web site: www.piaa.com.